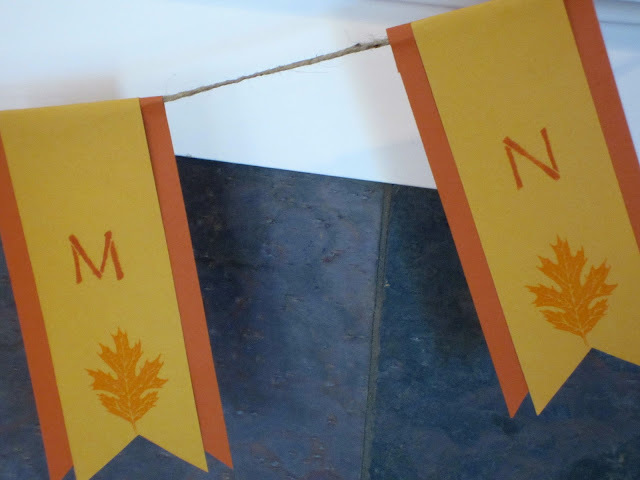 I have had an interest in making a banner for some time now, but until I saw all the creativity on blogland I didn't really know how to start. We don't have a traditional mantel over our fireplace. We have a big box shaped open space that is hard to decorate. 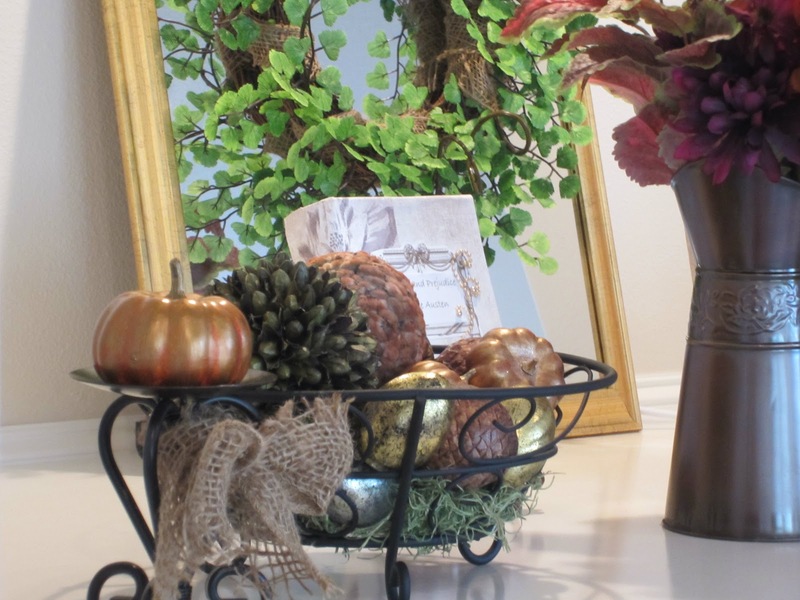 I also don't have that much fall decor right now because some things are packed away in boxes, so I used what I had and created a mix of things. 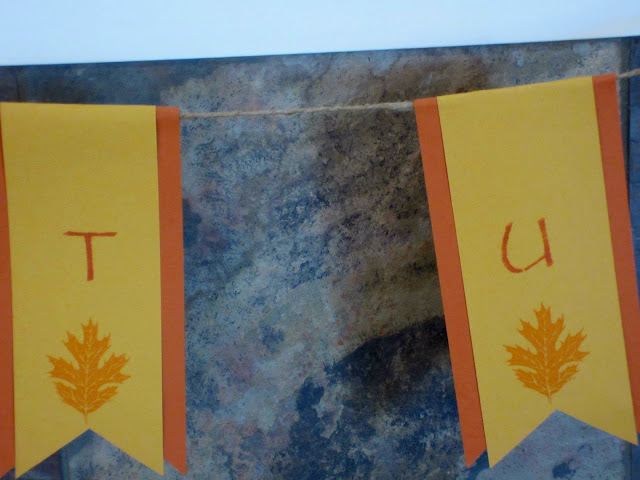 I knew that the decor I had would be a little too small for this space, so I wanted to add a banner for the fall season. 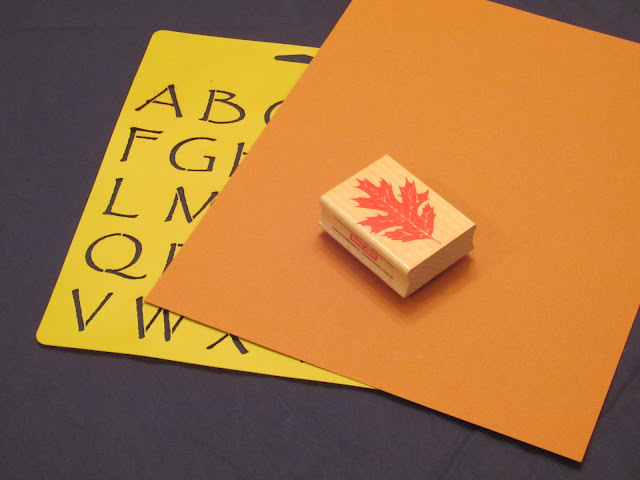 I used some rust and gold colored cardstock that I already had, as well as a leaf stamp and a stencil. It was a really easy project for me since I enjoy papercrafts so much. I wanted to contrast the two colors together so I cut long rectangles out of each and added a v shape to both of them at the bottom. 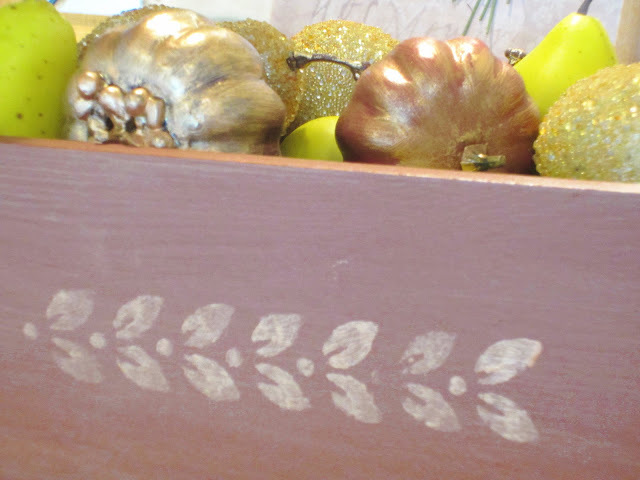 I added the letters with a stencil and used an oak leaf stamp for an accent. I then glued the letters to the jute cord and hung them on the mantel. I attached the jute cord to the mantel first and then added the letters to it. 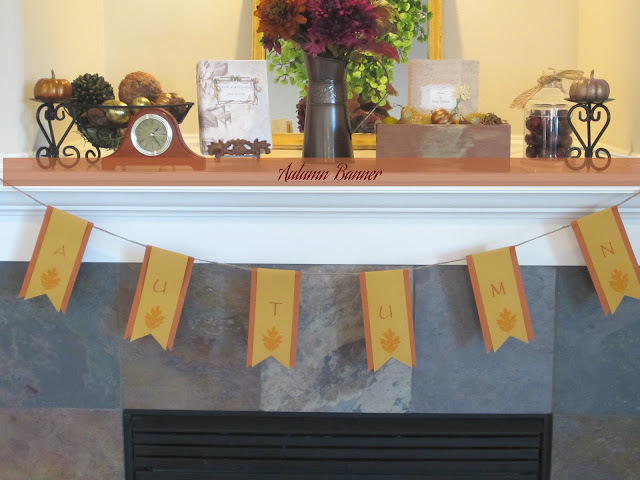 I wanted it to be evenly spaced so it would fill up the width of the mantel. Because I had so many things already to make the banner it was almost no cost to me. 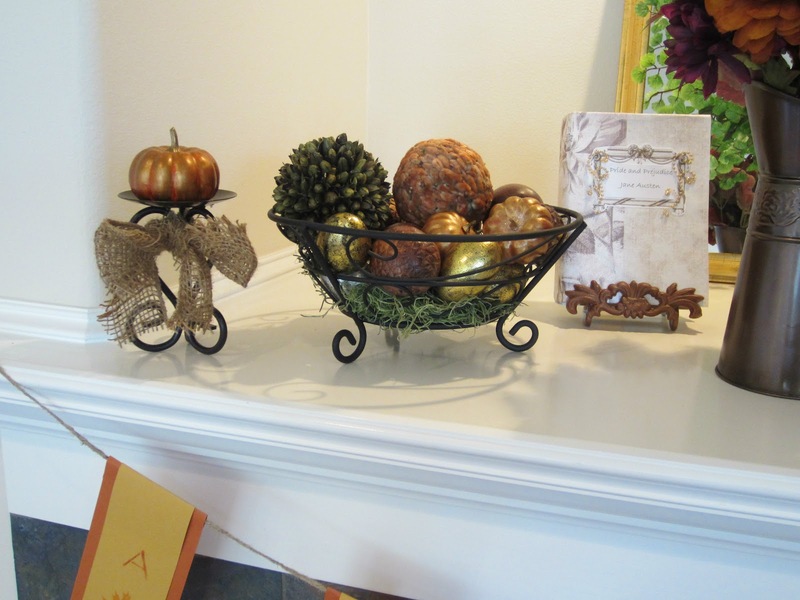 I added a metal basket and filled it with autumn colors and also added a fall plate. I decorated a small box with a leaf stencil and added some glittery pears and pumpkins. I also have a little jar of cherries. I love the burgundy color, although it doesn't show well in this picture. I wanted the colors to tie in with the flowers. 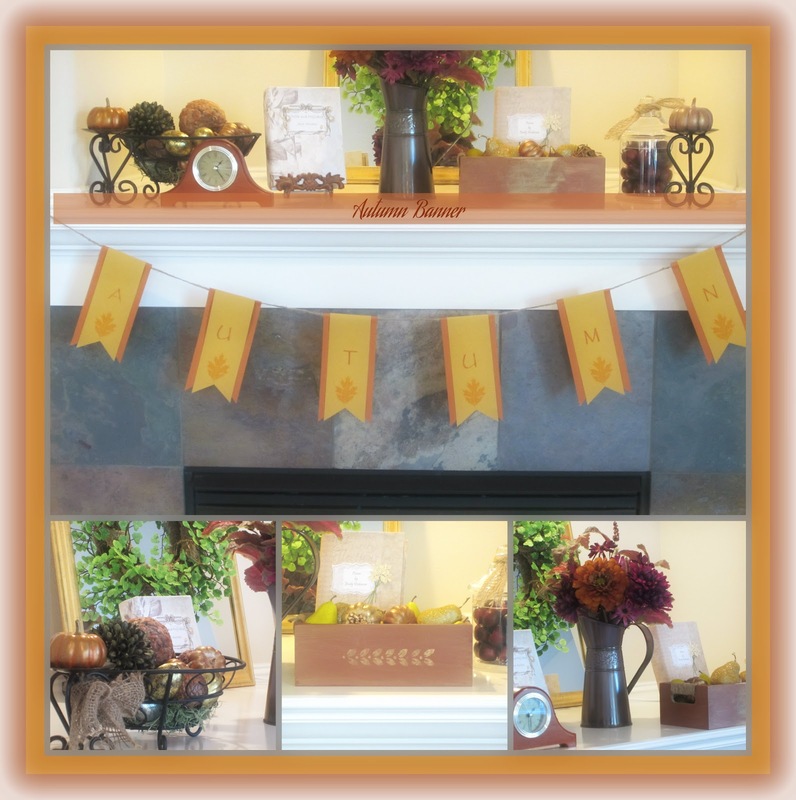 I added some little pumpkins to the candle stands and some shabby burlap bows. I also added the decorative book covers I made in a previous post. 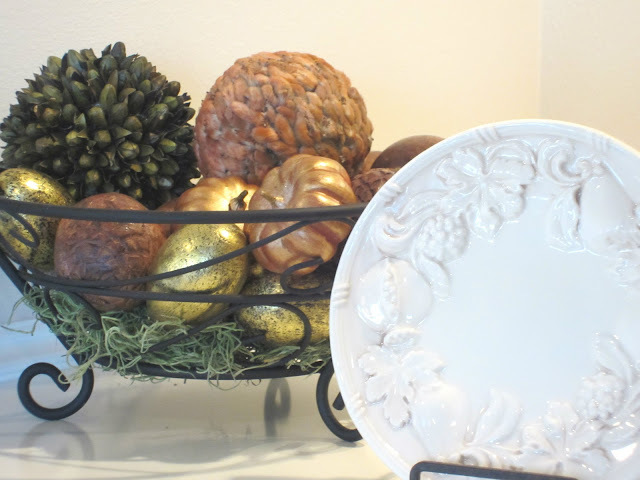 Just a little hodgepodge of things to fill up the mantel. I'm still lovin' my summer wreath but I will change it later. Most of these pics came out darker than I wanted because we have so little natural light on the west side of our living area. Most of our windows are on the east side. I'll show some pics of our entire fireplace later. We have had a nice sunny summer here, definitely not typical for the Pacific NW! Thanks for stopping by. Comments are appreciated! I really like your banner, it looks great and the price was right! Your banner turned out really pretty. So fallish!! 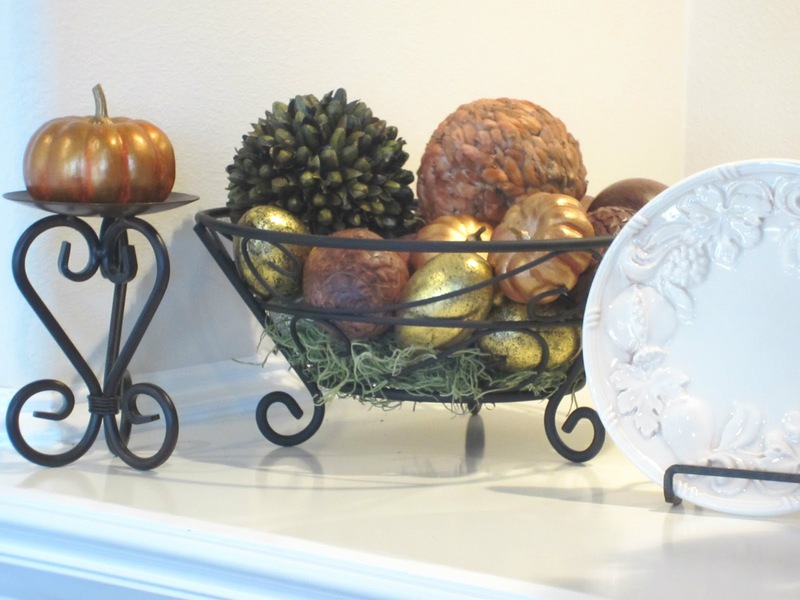 Then, all of the decor you added to your mantle just were the finishing touches. Great banner everything looks so beautiful...Thank you for coming by One More Time and linking up. I do appreciate it. Have a great weekend. 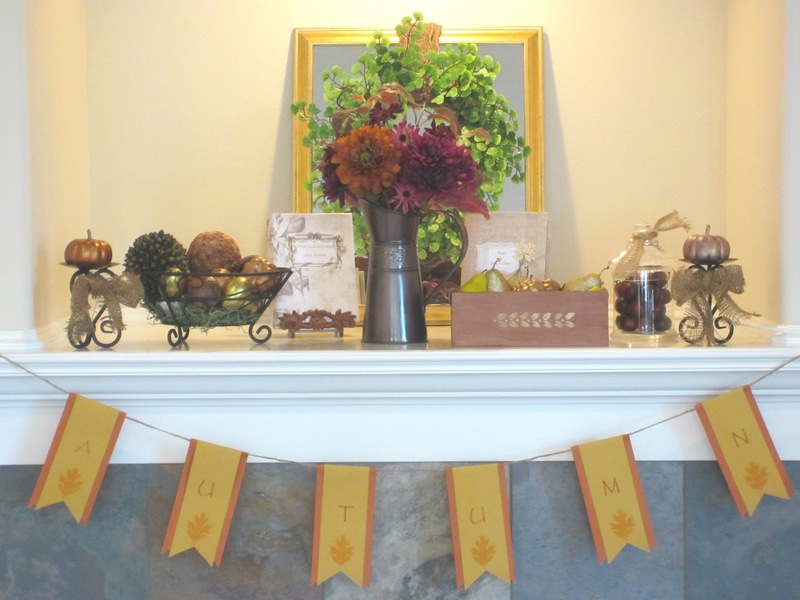 Love your fall banner, Diane! It all looks pretty. Now a follower! Thanks for the nice comment! I'm your newest follower now. So darling and so simple. You did a great job on your banner. Thanks for sharing. 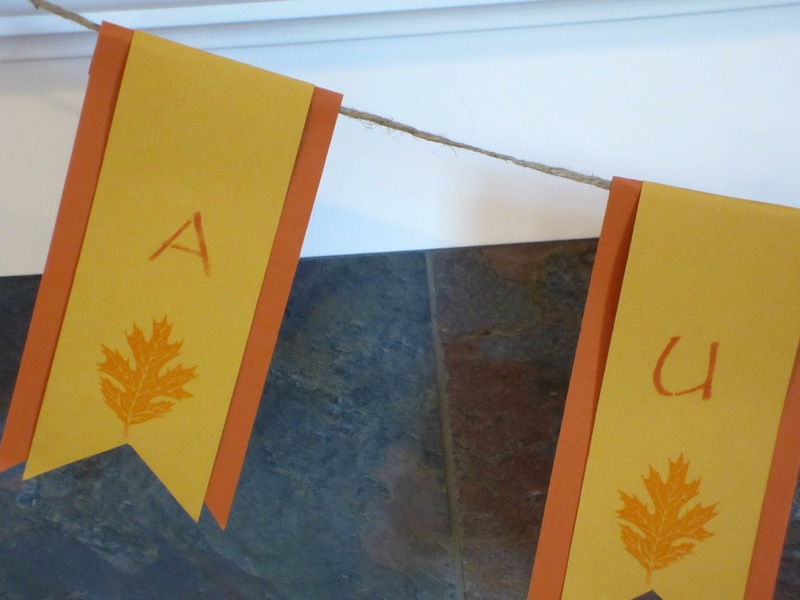 I love the simplicity of this banner! It is so pretty! Thank you for joining TTF last week. Hope to see you again. Have a fun day! Love that banner, did I say i love that banner. 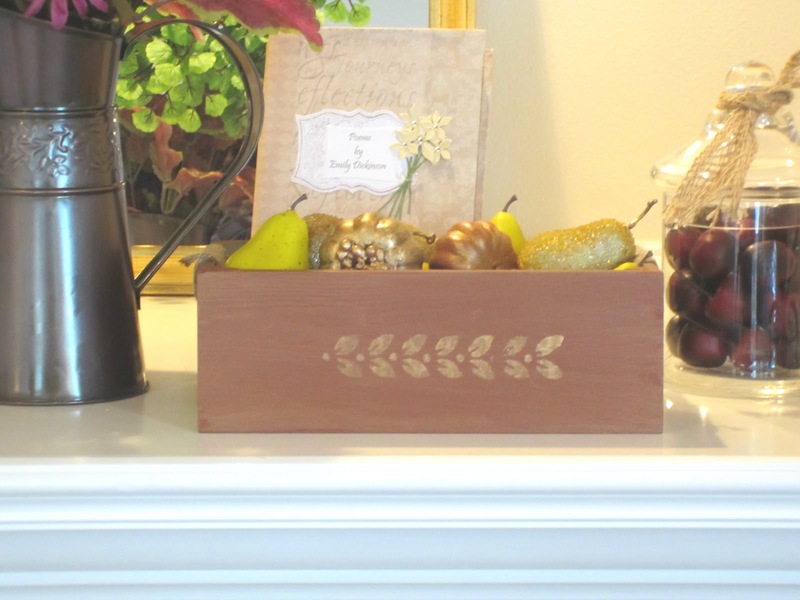 Your mantel is very pretty! Thanks for sharing your inspiration with Sunday’s Best – you helped make the party a success! Just stopping by to let you know you have been featured at One More Time... Party is up http://www.onemoretimeevents.com/2012/10/share-it-one-more-time-link-party-and_4.html stop by and pick up your featured button and I hope you can join the party again.